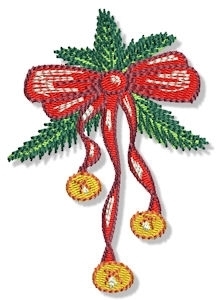 Christmas Mistletoe With Ribbon And Bells - 4X4! Perfect design for those in love! Great for apparel, bags, tablecloths, Christmas tree skirts, and stockings! Comes ready for the 4X4 hoop! Christmas Fun SWAK Pack- 4 Designs! Christmas Bird Filled Design - 4X4! Finish Size 2.06" X 3.87"